2015 I WRAPS I 47 More Options for Creativity As wrap films get better and better, graphics manufacturers, designers and end users have more options to apply their creativity in designs. I am starting to see car owners use 3M Wrap Film Series 1080 to customize their vehicle, when in the past they might have had the car repainted. The film is available in 75 color/finish options, so the choices for customization are very broad. Shops are also combining products in creative ways, such as wrapping a vehicle in a matte film and then adding gloss or reflective overlays on top. This creates a totally different look from paint or an out-of-the-box wrap. 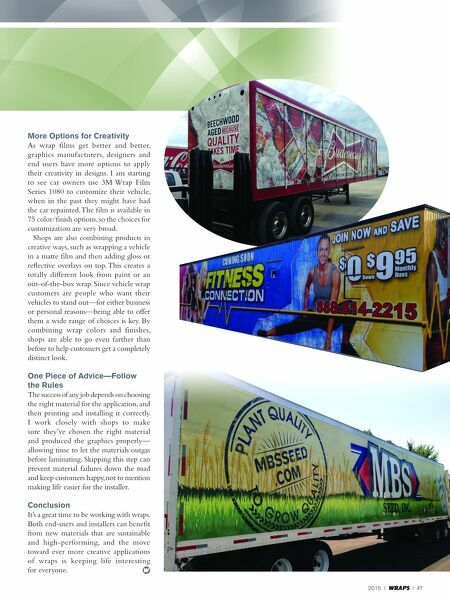 Since vehicle wrap customers are people who want their vehicles to stand out—for either business or personal reasons—being able to offer them a wide range of choices is key. By combining wrap colors and finishes, shops are able to go even farther than before to help customers get a completely distinct look. One Piece of Advice—Follow the Rules The success of any job depends on choosing the right material for the application, and then printing and installing it correctly. I work closely with shops to make sure they've chosen the right material and produced the graphics properly— allowing time to let the materials outgas before laminating. Skipping this step can prevent material failures down the road and keep customers happy, not to mention making life easier for the installer. Conclusion It's a great time to be working with wraps. 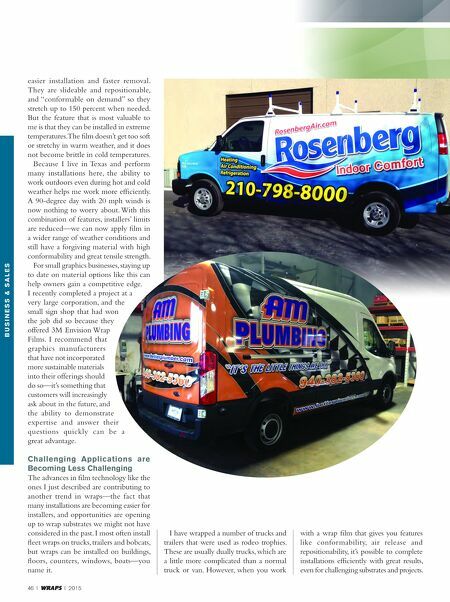 Both end-users and installers can benefit from new materials that are sustainable and high-performing, and the move toward ever more creative applications of wraps is keeping life interesting for everyone.